Pipkins' @HomeVantage gives organizations the ability to effectively manage their agents as the "Home Shoring" phenomenon continues to rapidly grow. Companies want to offer highly skilled employees a flexible work environment, making at-home scheduling even more important. At-home scheduling has been shown to reduce internal infrastructure costs and improve employee morale. Pipkins' @HomeVantage can be used with Vantage Point, or integrated into another workforce management (WFM) system to leverage existing technology. 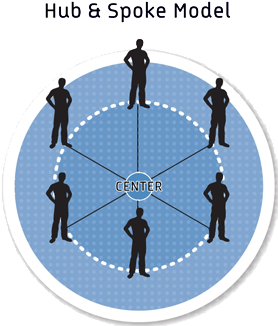 Many organizations prefer a "Hub and Spoke" model in which agents begin working in the call center, then after a period of time move to an at-home position within a certain mile radius of the center. This provides flexibility for the agent to come into the center during emergencies, company meetings, or for other activities. Pipkins' @HomeVantage is easily adaptable to the Hub and Spoke model. 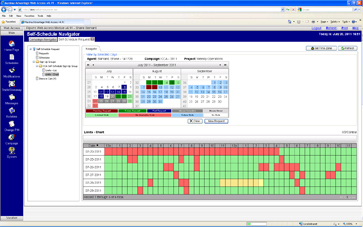 Vantage Point schedules both call center and at-home agents. Agents can be part of the "hub" schedule generation process, or build their own schedules by requirements generated by the workforce team. This ensures optimal scheduling to allow at-home agents flexibility to fill staffing gaps. As contact centers become truly virtual with at-home agent models, it is desirable to fully utilize the benefits of the scheduling tool. Pipkins' @HomeVantage allows virtual agents to pick and choose blocks of time in which they can build their own shifts according to established company rules and staffing requirements. 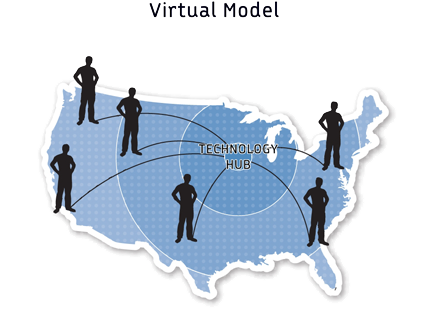 The Virtual Model provides optimal utilization of remote agents to fill staffing requirements based on business needs while improving agent morale and autonomy through use of self-service tools. Pipkins' @HomeVantage provides an easy agent self-service scheduling tool. The agent uses a checkout method for self-scheduling to accommodate staffing requirements based on business needs. The scheduling process ensures rules specific to organizational needs are met, including break and lunch times, hours worked, and any other specific organizational needs.